The words “sweater guard” probably bring to mind something your grandma keeps handy for when the weather is chilly. You’re probably right. 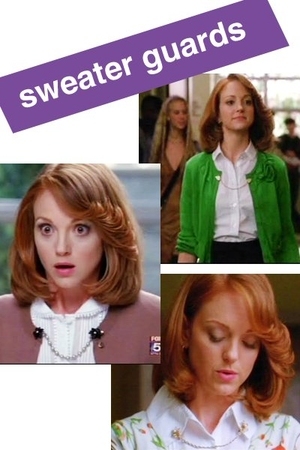 But I didn’t realize until after seeing the lovely Miss Emma Pillsbury on (my fave guilty pleasure-ish show) Glee wear them time after time in modern and interesting ways. Since being popular in the 50s, sweater guards have since been mostly forgotten and overlooked as an accessory/jewelry piece. Which means it’s the perfect way to bring some unexpected pizzazz to your outfits. While they can be worn in the traditional way, on your sweaters to hold them ajar, sweater guards also look adorable when clipped to the collar of your favorite button-up shirt, as Miss Pillsbury demonstrates in the bottom left photo. 6. On the back of a sweater or jacket to help cinch it in. If you’re creative you can definitely come up with a way to work one into your wardrobe. I freakin love Emma!! She wears the cutest sweaters. I didn't know that's what they were called, great post. omg, I never noticed that's what Emma's wearing in glee :D haha..i love her character even more for introducing "sweater guards" to us ignorant people! I love glee! These are great! you know, I never paid attention to this. looks kind of sweet. might have to try it. thanks! A vintage _and_ versatile accessory? Sign me up! Maybe a pair of these can help keep super-skinny straps from sliding off my shoulders. Wow! I forgot about these! Love them! Yup, already own one and lloking for more! they're great! I love Emma Pillsbury's character! She's just so different but sweet! I LOVE those!!! I think I need some like the heart ones... these would be perfect for some of my cardis. Thanks for this!!! hmm, i never even knew these existed! i might have to get some now..
Great, i actually have one and hopefully will be wearing it one of my outfits soon! Ahh! This is such a great post! I love all the alternative uses, I need to go to a vintage shop asap <3 thank you so much for posting this!!! oh i have two pairs i never really use, definitely using them now. she's so cute too! I have a few of these, I use them mostly for number 6. Never knew they were called Sweater Guards though. Mine are just plain though, not nearly as cute as the hearts or bows.